This book is recommended reading for planners preparing to take the AICP exam. In this new book, the author bridges the gap between theory and practice. The author describes an original approach-Feedback Strategy-that builds on the strengths of previous planning theories with one big difference: it not only acknowledges but welcomes politics-the bogeyman of real-world planning. Don't hold your nose or look the other way, the author advises planners, but use politics to your own advantage. 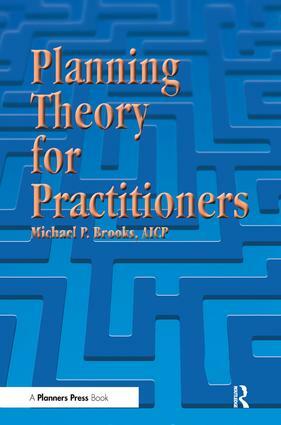 The author admits that most of the time planning theory doesn't have much to do with planning practice. These ideas rooted in the planner's real world are different. This strategy employs everyday poltiical processes to advance planning, trusts planners' personal values and professional ethics, and depends on their ability to help clients articulate a vision. This volume will encourage not only veteran planners searching for a fresh approach, but also students and recent graduates dismayed by the gap between academic theory and actual practice.